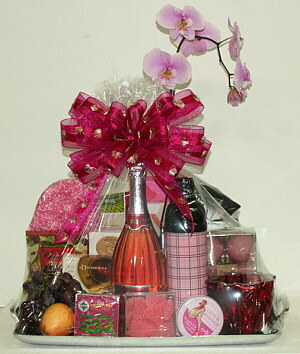 Being located in Hollywood we are often called upon to create special gift baskets for celebrities. Today, for instance, we were asked to create a unique custom gift basket for fitness expert Richard Simmons. We wanted something elegant, but flamboyant. Classy, but fun. We started with one of our heavy cast serving trays and a bottle of sparkling Moscato and went on from there.